NASA has recently released a totally beautiful photo captured by the Hubble Space Telescope of the debris of a star that blasted 8,000 years ago. 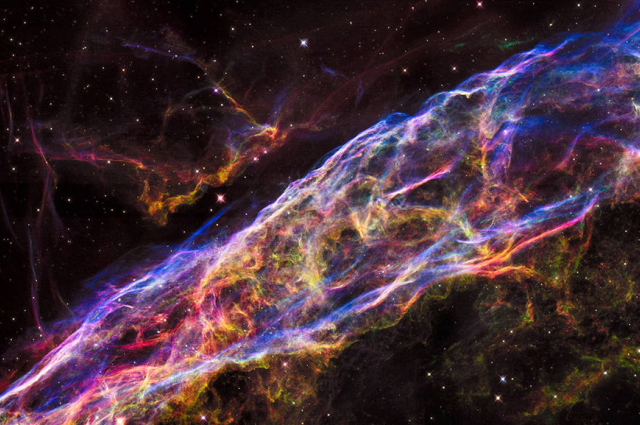 What you are looking here at is the Veil Nebula, a supernova leftover more than 2,000 light-years away. The photo you see here has been stitched together from six Hubble images, each covering an area about two light-years across. It’s only a tiny portion of the whole nebula, which has a diameter of nearly 110 light-years. The nebula, which was initially snapped by the Hubble in 1997, was once a star almost 20 times more massive than our Sun. The light we can see in the photo above is being produced by a fast-moving blast wave from the star’s detonation as it meets a wall of cool, thicker interstellar gas that was propelled into space by the star before it blasted. The colors relate to the former star’s gases: the red glow is the result of hydrogen, blue is from oxygen and green from sulfur. To give some perception, NASA has made a video that zooms in from the night sky to the constellation Cygnus, where this stunning nebula lies. So you should take a look below.